If you live in Arizona, then you’re aware of the monsoon season, a rainy time of year that takes place from June through September. 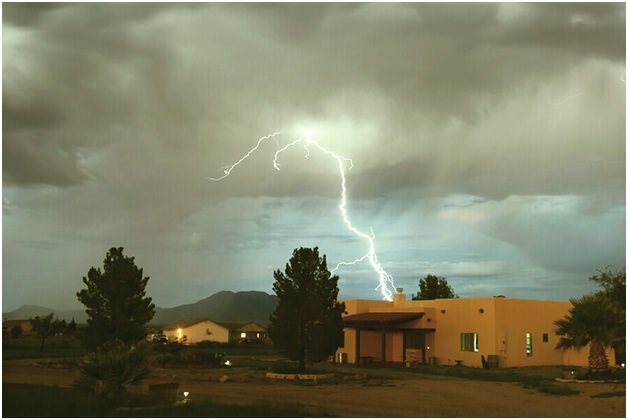 When humidity, pressure and the desert climate mix, it can result in sever thunderstorms, lightning, hail, flash floods, high winds, dust storms and a higher heat index. For homeowners, the biggest concern is monsoon season and water damage in Arizona. Clean out your rain gutters: Rain gutters are the sneaky culprit when it comes to water leaks in your roof. Clogged gutters don’t drain properly and result in water pooling in areas around the roof. When you combine this with heavy downpours and consistent rainfall, it can result in leakage through broken tiles and damaged areas. To avoid this, make sure you clean your gutters at least one time per year. Trim trees and loose limbs: Monsoon storms frequently uproot trees and are a key reason why cars and homes sustain damage during heavy storms. The simple solution is to trim loose limbs, cut down dying trees and maintain all vegetation in your front and back yard before the stormy season. Make sure you pay special attention to any trees and plants that overhang your property line into a neighbor’s property to avoid any type of liability should damage occur. Update your homeowner’s insurance: What type of coverage and deductible do you have on your homeowner’s insurance policy? It’s a good idea to contact your agent and make sure you’re covered. Most insurance companies offer extreme storm coverage, which adds even more items and, in some cases, a lower deductible. This can give you the peace of mind in knowing that you’re covered in case something unpredictable should occur. Preparing for unexpected water damage: When unexpected water damage happens, the first thing you should consider is the safety of you and your family. Following the storm, you can explore your options with restoration services; most will work with you and with your insurance company to make sure that your out of pocket costs are minimized and that your home is restored as quickly as possible. Dealing with major damage: If your home sustains major damage and you believe that it may have been caused by uncertified alterations in waterflow, you will want to consider your options with an experienced real estate attorney in Arizona. Only qualified legal counsel can advise you of what to do when litigation is involved. Monsoons can be fearsome storms, but if you’re well prepared, you can weather them just like any other. Knowing what your options are in advance goes a long way in offering the peace of mind that any homeowner desires. Make sure you rely on these tips in advance to help you stay ahead of the curve.